Steering Motor Test System – Crest Test Systems Pvt. Ltd. 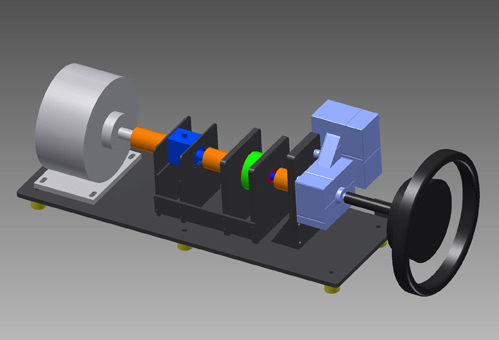 The Steering Motor Test System evaluates the performance and carries out quality analysis on electric motors by using an electromechanical brake as a load, an optical encoder, and a reaction torque sensor/load cell arrangement. The system makes use of a reliable and robust production-class hardware for performing a number of tests and accurately measuring various parameters. A precision-machined mechanical fixture is used for securing motors of various frame sizes to have minimal axial misalignments with the measuring hardware. All the measurements are made by the system according to the parameters selected by the user and the test results are displayed on a PC for evaluation. The system can be designed for testing different types of motors, such as DC motors, BLDC motors, AC induction motors, stepper motors, etc. In place of an electromechanical brake, the system can be offered with a regenerative load as a value addition.